Well, one article after I set out the rules, I guess I’m going to break them; however, the issues in question were in the three month rule when I picked them up, and the front page doesn’t update if nothing gets submitted, so here comes issue number four. For only four articles in, I seem to be doing a lot of penultimate Christos N. Gage pieces. 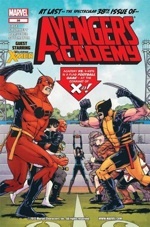 This time, we go to Avengers Academy, where the cast of Wolverine and the X-Men are guest stars. Seeing how these two books are the furriest of the approximately ten thousand put out by Marvel for these two teams, that works well for a furry site. Furry characters (depending on your personal definition, of course) include Tigra, Reptil and White Tiger for the Avengers and Wolverine, Anole and Warbird for the X-Men. Instead of fighting super evil villains this month, the two school-based books get together for a game of tag football. The book has a large cast, which is now doubled; we get a lot of interpersonal interactions. Most are probably pretty hard to follow if you haven’t been reading the book (and being the second to last issue doesn’t make this a great jumping-on point), but Gage’s sense of humor helps this issue out a lot (though a dated “don’t tase me, bro” joke was kind of lame). The art, by Tom Grummett, is clean and simple. Many Marvel titles suffer from art styles and techniques that are a bit too pretentious for the subject matter. The cover wins the award for best of this rundown; “AT LAST – the spectacular 38TH ISSUE!” Great joke. 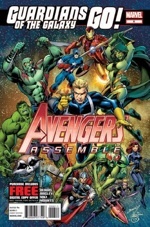 Avengers Assemble is not exactly the most noble comic book on the shelves; it is fairly obviously a movie tie-in that Marvel has rather laughably tried to pass off as an ongoing series. And now they’re bringing in the Guardians of the Galaxy, because they have a movie coming up, and also the villain is Thanos, since he’s the villain of the next Avengers movie. Thanos, I can ignore, but if this cameo gets the Guardians another book, well, that would be all right. I miss the non-furry but owner of a surprisingly well done character arc Jack Flag, and of course, I miss good dog Cosmo. However, the team still has super-furry Rocket Raccoon, who is awesome. Full stop. Groot is also awesome, though not furry. Interestingly, though Mantis will apparently be in the movie, in this comic she’s replaced by anthropomorphic insect teammate Bug, which is fine with me. I liked him better in the Guardian’s own prematurely stalled series. The rest of the team consists of muscular green aliens and a token human. Brian Michael Bendis, the Avengers guy at Marvel for about a decade, has a lot of fun with the dialogue; the exposition is, well, exposition, but still a lot better than the action, which is bogged down by Mark Bagley’s pencils. Bagley sure can’t draw a furry raccoon. I’ve been waiting for an issue of Hack/Slash like this since I started doing these; I figured I could always use Hack/Slash as a backup as long as Dog and Cat Detective agency were on the case. Unfortunately, just as soon as I began, an arc started up that was the first since the series switched to Image without Cat Curio and Pooch. But in this issue, they make their triumphant return with a one-and-done story devoted to them. The Cat of Dog and Cat Detective agency isn’t actually a cat, so she isn’t furry. She’s a Nancy Drew type young girl detective who was stabbed by a recurring series villain as a child (in one of this horror comedy series’ most jaw-droppingly horrific issues); thankfully, she got better, but spent her adolescence in a coma, so she never grew up. Pooch is furry; basically, an ugly, hairless (so not literally furry) cross between a mutt and a Lovecraftian horror who used to belong to an evil Elvis expy before becoming a good guy. Together, they fight crime! The great thing about Hack/Slash is that writer and creator Tim Seeley plays fair with every genre he parodies, whether it’s the usual slashers or the actually pretty straight detective story this issue contains. That said, when it gets funny, it is one of the funniest books on the marketplace. Highly recommended. The egregiously-overexposed-and-overpowered Wolverine is no more a furry character than, say, the unfairly-obscure Razorback (who is at least funnier, and whose costume at least vaguely resembles a mascot/fursuit). Remember when Wolverine and the Punisher were created merely as throwaway foes for the Hulk and Spider-Man to tussle with respectively? I do, and superhero comics would be better off if they'd stayed that way. Razorback and Tigra were the official Avengers Initiative team for Arkansas, I believe. As far as Wolverine was concerned he was supposed to be a wolverine mutated into a human, and then he became th e metal claw popping monstrosity we know and love (it's a phrase, I just went with it). He's popular with immature boys; kind of the lifeblood of comics sales back in the day. He's been written by so many people in so many ways (just like every major superhero) making sweeping generalizations about the character is impossible; Joss Whedon's Astonishing X-Men is my favorite version of the character. Basically, he likes beer is his defining character trait in that run, though Emma Frost regressing him to a child is also hilarious. Jason Aaron's Wolverine and the X-Men is currently the best version. I don't know, it just seems like superhero comic book characters are an odd thing to get snobby about. People who shy away from making aesthetic value judgments for fear of appearing "snobby" are the sort of people who end up watching nothing but Police Academy 1-7: The Compleat DVD Box Set interspersed with Fox News. Sir (or madame, I guess), there is a difference between "making aesthetic value judgements (which I've clearly already done, seeing as how I wrote a review) and being a snob.